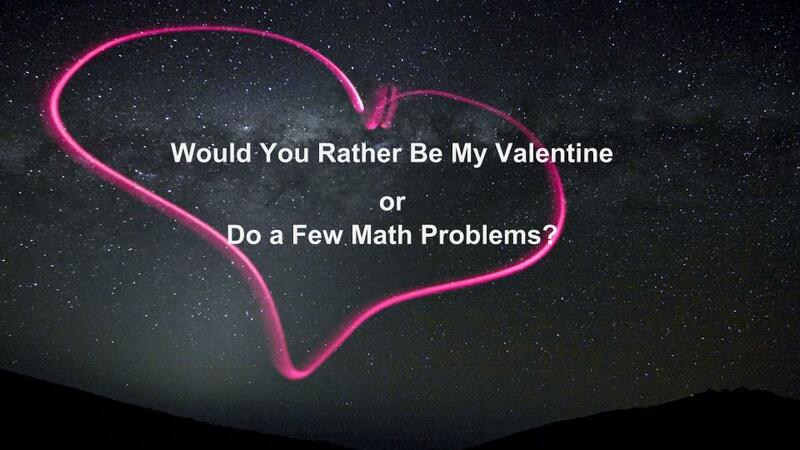 Would You Rather Be My Valentine or Do a Few Math Problems? Earlier this month, I saw a post by Richard Byrne that led me to this great site of mathematical “Would You Rather” problems. John Stevens (@JStevens009) is the clever man who creates these mathematical challenges, and I love the thinking that is required to solve the questions he poses. I tried a few with my 3rd graders, and they were hooked. Many of the problems, though, require a little more advanced math knowledge than generally possessed by 8-year-olds, so I thought about penning a few of my own. Since Valentine’s Day is closing in, I decided to go with that theme. I asked John if he minded me borrowing his idea, and he generously gave me the go-ahead. The rule I give my students for these problems is that they must prove their answer using mathematical reasoning. They are allowed to use the internet to research and/or do some hands-on measurements. It’s possible that they may be able to justify completely different answers. For example, on the one about the pound of chocolate, they might choose the lower amount instead of the higher because they are not huge fans of chocolate – though that seems to be rather rare. Feel free to use the Google Presentation, this Powerpoint file, or this PDF. UPDATE 2/8/16: Here is a link to my post that includes a printable sheet for students to record their Would You Rather responses. For more Valentine-related links, check out this post! Great math problems for Valentine’s Day. Masterful! I’m sharing them with my staff! Thanks! I hope they find a use for them! Thanks! I bet you will come up with even better ones! I’m a little late in catching up on my reading. This is great and will use as examples when my students create their own! Thanks! I would love to see what they come up with!